The term “metropolis” is typically used to refer to a large, bustling city with tall buildings and constant movement. A 1927 silent movie by the same name made cinematographic history, and despite its subtle-but-strong influence on popular culture, you’ve likely never even heard of it. Set in 2026, the narrative depicts a young man who learns of the horrors of classism and finds love with a revolutionary. Freder Fredersen, played by Gustav Fröhlich, is the son of the wealthy Joh Fredersen, who rules the great city of Metropolis. A school teacher named Maria, portrayed by Brigitte Helm, takes a group of workers’ children to observe the lives of the upper class. As they’re herded away by security, Freder’s curiosity leads him to follow Maria. While on his search for her, Freder ends up in the machine hall, in which he witnesses some workers killed accidentally by the machines they work on. Through witnessing this incident, Freder comes to understand that his livelihood and that of the rest of the upper class is built on the backs of workers, who live beneath the city and whose lives are not nearly as good as those wealthier. Freder finally finds Maria, who preaches hope to the proletarians in an old church building, a stark contrast to the modern, mechanized world above their heads. Freder’s father, Joh, has heard of the rebellious Maria, whose speeches suggest equality between classes. He discovers that the inventor Rotwang has been experimenting in the creation of a cyborg based on Hel, the beloved mother of Freder. Joh orders it be made instead into the likeness of Maria, which creates havoc and causes disruption within the workers’ ranks, likely to show what uncivilized people the workers were. The robot achieves this goal, and the workers rebel from their jobs, causing the machines to break and the underground city to flood. Meanwhile, the actual Maria and Freder evacuate the children, saving them from drowning. Once the rebelling workers become aware of the chaos they brought upon their children by following the order of Maria’s likeness to cease work on the machines, they burn the cyborg at the stake. In the end, a solution to the inequalities between the rulers and the workers is found, and Freder is free to love Maria. The influence of Metropolis can still be seen today. The cyborg inspired the character C3PO in the Star Wars franchise, for example. The movie has been referenced by celebrities like Madonna and Beyoncé and, over the years, has garnered a major cult following. For its time, Metropolis was extremely advanced in both design and shooting style. Much of the movie was lost, however, after a fourth of the original film was cut by Paramount upon its American release. But in 2008, a nearly complete version of the film was discovered in Buenos Aires, Argentina. In 2010, 83 years after its initial release in Germany, audiences were finally able to view the movie the way its director always intended. 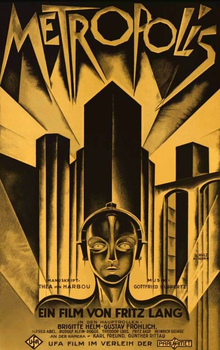 Such influential films like Metropolis are not commonly seen, and don’t always stand the test of time as this one has. But when they do, they should be appreciated for the masterpieces that they are.